Structure and Interpretation of Computer Programmers – Page 3 – One monkey. One keyboard. Infinite possibilities. Readers of OOP the easy way will be familiar with the distinction between object-oriented programming and procedural programming. You will have read, in that book, about how what we claim is OOP in the sentence “OOP has failed” is actually procedural programming: imperative code that you could write in Pascal or C, with the word “class” used to introduce modularity. The first clue that this is a procedure, not a method, is that it isn’t attached to an object. The first change on the road to object-orientation is to make this a method. Its parameter is an instance of World, so maybe it wants to live there. The next non-object-oriented feature is this free distance procedure floating about in the global namespace. Let’s give the Shot the responsibility of knowing how its proximity fuze works, and the World the knowledge of where the Klingons are. Cool, we’ve got rid of that spaghetti code label (“That’s the first time I’ve ever been tempted to use one of those” says Martin). Incidentally, we’ve also turned “loop over all shots and all Klingons” to “loop over all shots and nearby Klingons”. The World can maintain an index of the Klingons by location using a k-dimensional tree then searching for nearby Klingons is logarithmic in number of Klingons, not linear. By the way, was it weird that a Shot would hit whichever Klingon we found first near it, then disappear, without damaging other Klingons? That’s not how Explosions work, I don’t think. As it stands, we now have a related problem: a Shot will disappear n times if it hits n Klingons. I’ll leave that as it is, carry on tidying up, and make a note to ask someone what should really happen when we’ve discovered the correct abstractions. We may want to make removing a Shot an idempotent operation, so that we can damage multiple Klingons and only end up with a Shot being removed once. There’s a Law of Demeter violation, in that the World knows how a Klingon copes with being hit. This unreasonably couples the implementations of these two classes, so let’s make it our responsibility to tell the Klingon that it was hit. No, better idea! Let’s make the Shot hit the Klingon. Also, make the Shot responsible for knowing whether it disappeared (how many episodes of Star Trek are there where photon torpedoes get stuck in the hull of a ship? ), and whether/how it explodes. Now we will be in a position to deal with the question we had earlier, because we can ask it in the domain language: “when a Shot might hit multiple Klingons, what happens?”. But I have a new question: does a Shot hit a Klingon, or does a Shot explode and the Explosion hit the Klingon? I hope this starship has a business analyst among its complement! But didn’t I say that the shot understood the workings of its proximity fuze? Maybe it should search the World for nearby targets. As described in the book, OOP is not about adding the word “class” to procedural code. It’s a different way of working, in which you think about the entities you need to model to solve your problem, and give them agency. Obviously the idea of “clean code” is subjective, so I leave it to you to decide whether the end state of this method is “cleaner” than the initial state. I’m happy with one fewer loop, no conditions, and no Demeter-breaking coupling. But I’m also happy that the “OO” example is now object-oriented. It’s now looking a lot less like enterprise software, and a lot more like Enterprise software. Woah, too many products. Let me explain. No, it will take too long, let me summarise. Sometimes, people running software organisations call their teams “product teams”, and organise them around particular “products”. I do not believe that this is a good idea. Because we typically aren’t making products, we’re solving problems. The difference is that a product is “done”. If you have a “product team”, they probably have a “definition of done”, and then release software that has satisfied that definition. Even where that’s iterative and incremental, it leads to there being a “product”. The thing that’s live represents as much of the product as has been done. The implications of there being a “product” that is partially done include optimising for getting more “done”. Particularly, we will prioritise adding new stuff (getting more “done”) over fixing old stuff (shuffling the deckchairs). We will target productish metrics, like number of daily actives and time spent. The software created to present the current understanding of the solution. In this formulation, we don’t want “amount of product” to be a goal, we want “sufficiency of solution” to be a goal. We accept that the software does not represent the part of the “product” that has been “done”. The software represents our best effort to date at modelling our understanding of the solution as we comprehend it to date. We therefore accept that adding more stuff (extending the solution) is one approach we could consider, along with fixing old stuff (reflecting new understanding in our work). We accept that introducing the software can itself change the problem, and that more people using it isn’t necessarily a goal: maybe we’ve helped people to understand that they didn’t actually need that problem solved all along. Now our goals can be more interesting than bushels of software shovelled onto the runtime furnace: they can be about sufficiency of the solution, empowerment of the people who had the problem, and improvements to their quality of life. Despite the theory that everything can be done in software (and of course, anything that can’t be done could in principle be approximated using numerical methods, or fudged using machine learning), software engineering itself, the business of writing software, seems to be full of tools that are accepted as de facto standards but, nonetheless, begrudgingly accepted by many teams. What’s going on? Why, if software is eating the world, hasn’t it yet found an appealing taste for the part of the world that makes software? Let’s take a look at some examples. Jira is very popular among many people. I found a blog post literally called Why I Love Jira. And yet, other people say that Jira is an anti pattern, a sentiment that gets reasonable levels of community support. Jenkins is almost certainly the (“market”, though it’s free) leader among continuous delivery tools, a position it has occupied since ousting Hudson, from which it was forked. Again, it’s possible to find people extolling the virtues and people hating on it. So, weird question, why does everybody do this to themselves? And then more specifically, why is your team doing it to yourselves, and what can you do about it? This appeals to the desire among software engineers to find generalisations. “Look,” we say, “Jenkins is popular, it can definitely be made to do what we want, so let’s start there and configure it to our needs”. Let’s take the opposing view for the moment. I’m going to drop the programming language example of JS/Rust, because all programming languages are, roughly speaking, entirely interchangeable. The detail is in the roughness. The argument below still applies, but requires more exposition which will inevitably lead to dissatisfaction that I didn’t cover some weird case. So, for the moment, let’s look at other tools like Jira and Jenkins. The exact opposing view is that our project is distinct, because it caters to the needs of our customers and their (or these days, probably our) environment, and is understood and worked on by our people with our processes, which is not true for any other project. So rather than pretend that some other tool fits our needs or can be bent into shape, why don’t we build our own? And, for our examples, building such a tool doesn’t appear to be a big deal. Using the expansive software engineering term “just”, a CD tool is “just” a way to run each step in the deployment pipeline and tell someone when a step fails. A development-tracking tool is “just” a way to list the things the team is or could be working on. This is more or less a standard “build or buy” question, with just one level of indirection: both building and buying are actually measured in terms of time. How long would it take the team to write a new CD tool, and to maintain it? How long would it take the team to configure Jenkins, and to maintain it? We are at x, of course. 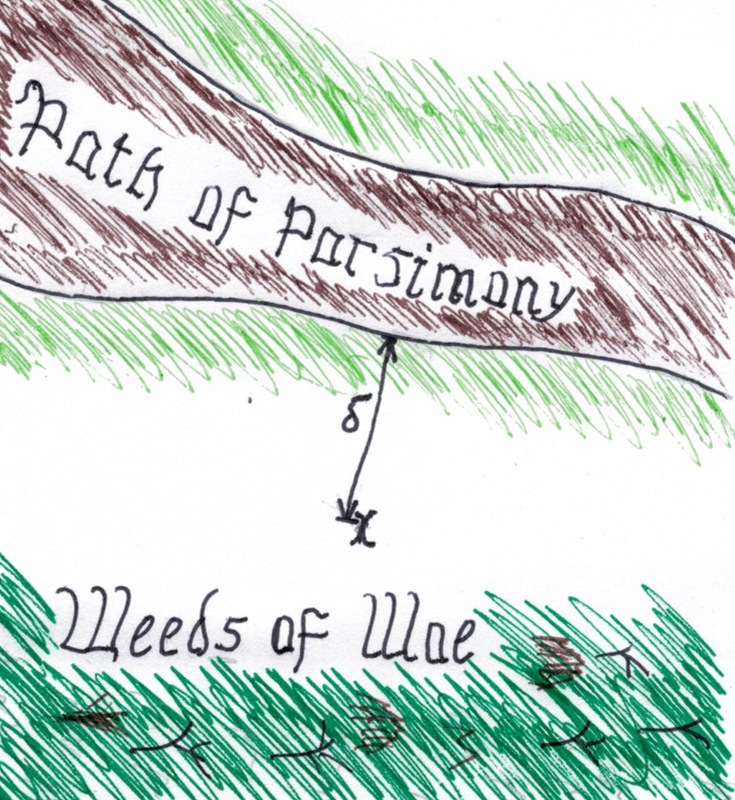 We are a short way from the Path of Parsimony, the happy path along which the generic tools work out of the box. That distance is marked on the map as ∂. Think about how you would measure ∂ for your team. You would consider the expectations of the out-of-the-box tool. You would consider the expectations of your team, and of your project. You would look at how those expectations differ, and try to quantify the result. This tells you something about the gap between what the tool provides by default and what you need, which will help you quantify the amount of customisation needed (the cost of building a spur out from the Path of Parsimony to x). You can then compare that with the cost of building a tool that supports your position directly (the cost of building your own path, running through x). But the map also suggests another option: why don’t we move from x closer to the path, and make ∂ smaller? Which of our distinct assumptions are incidental and can be abandoned, which are essential and need to be supported, and which are historical and could be revised? Is there a way to change the context so that adopting the popular tool is cheaper? My impression is that these questions tend to get asked once at the start of a project or initiative, then not again until the team is so far away from the Path of Parsimony that they are starting to get tangled and stung by the Weeds of Woe. Teams that change tooling such as their issue trackers or CD pipeline tend to do it once the existing way is already hurting too much, and the route back to the path no longer clear.